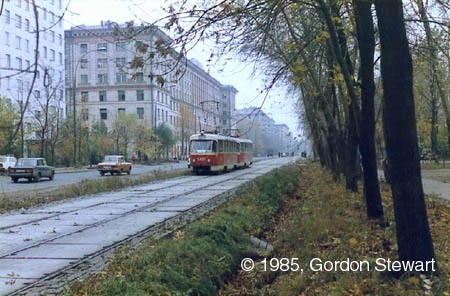 The tramline along this street (perhaps having one of the longest street names in Moscow) linked in 1938 the already existed tramway termini "Koptevo" and "Zavod imeni Voikova" (now "Metro Voikovskaya"). 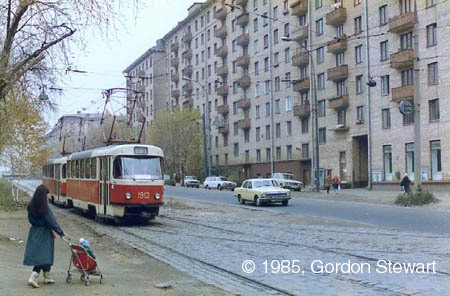 The street was called Novopodmoskovnaya in those days, resembling the rather new districts that had been built around the Podmoskovnaya railway station. The station, by the way, also changed its name with years, and today it is named "Krasniy Baltiets". Anyway, the street took its current shape in 1950's, and the current name - in 1960. There was a house in this street where the two Heroes of the Soviet Union had lived in 1930's; they perished fighting the Nazi during the war. The tram tracks have their own right of way in this street, and there are even some places here where the original drains along the line can be found, though they have mostly vanished during the long years. 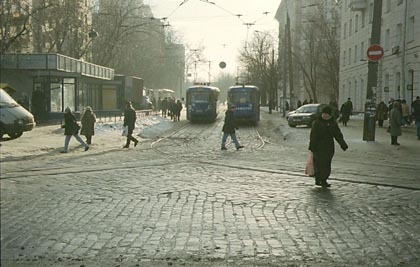 A view of the Kosmodemianskikh Street from Voikovskaya terminus. Another tramline branches to the right (see the next photo). 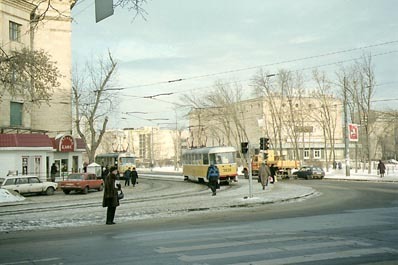 A crossroad of the 1st Novopodmoskovniy Pereulok and Kosmodemianskikh Street. 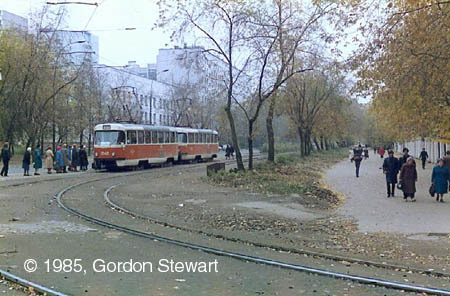 Tram tracks were relocated hither from Leningradskoye Shosse in 1961. The same crossing sixteen years later. As you can see this place has not changed too much; only the number of trees decreased, and new small shops grew along the walkway. Even the pavement remains the same. 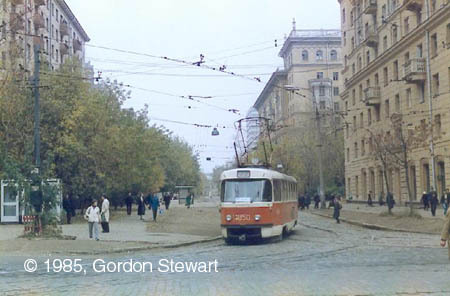 Again the same crossing, now looking to Kosmodemianskikh Street. This train of route 23 is going to turn to 1st Novopodmoskovniy Pereulok - the same route, the same move can be seen today. Only the tram model and livery have slightly changed. 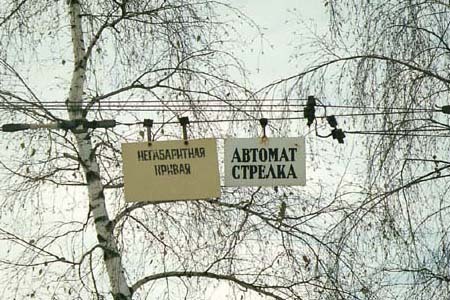 A small collection of tram-related signs on the overhead. Old water drain trenches still can be seen here and there along the tracks. 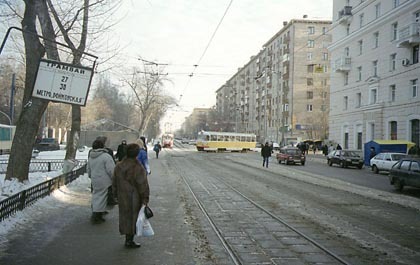 The last tram stop in Kosmodemianskikh Street is located at the crossing with Klara Zetkin street. The line leaves this street and continues to Koptevo district. The same curve at the crossing, with Rassvet cinema in a distance.